The feature extraction tab in CaPTk enables clinicians and other researchers to easily extract feature measurements, commonly used in image analysis, and conduct large-scale analyses in a repeatable manner. 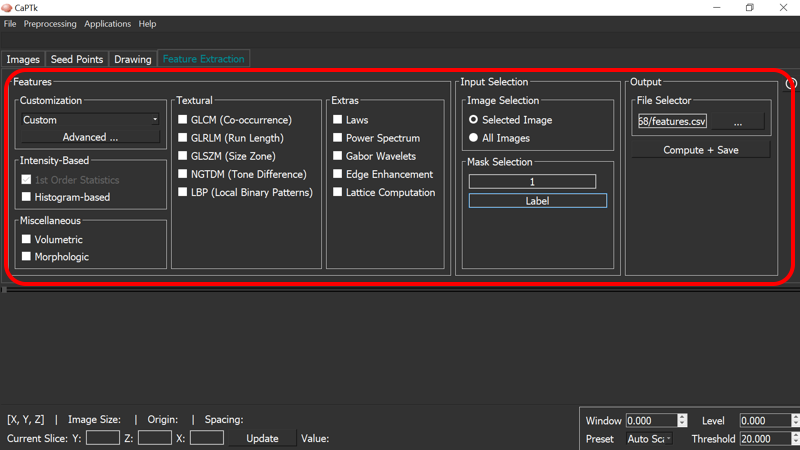 Although the feature panel in CaPTk is continuously expanding, it currently comprises i) intensity-based, ii) textural (GLCM, GLRLM, GLSZM, NGTDM, LBP), and iii) volumetric/morphologic features. You can find the exact list of features incorporated in CaPTk, together with their mathematical definition in the corresponding How-To section. Specialized applications in CaPTk, such as "EGFRvIII Surrogate Index", "Survival Prediction", "Recurrence Estimator", and "SBRT-Lung" use features of this panel. However, the general idea is to keep the features generic and adaptable for different types of images by just changing the input parameters. Currently we provide some pre-selected parameters for Neuro and Torso images (i.e., Brain, Breast, Lung). Users can alter these pre-selected values through the Custom menu option, or create their own set of parameters via the Advanced menu. The output of the feature extraction tab is a text (.csv) file, with feature names and values. Note that the reported features are extracted per modality, per annotated region and per offset (offset represents the radius around the center pixel; for radius 1, the offset will be +/- 1) value.